This is a sponsored post written by me on behalf of Nature’s Recipe®. All opinions are 100% mine. Our dog, Loki is part of the family – we’re celebrating him today with this fun and easy DIY. 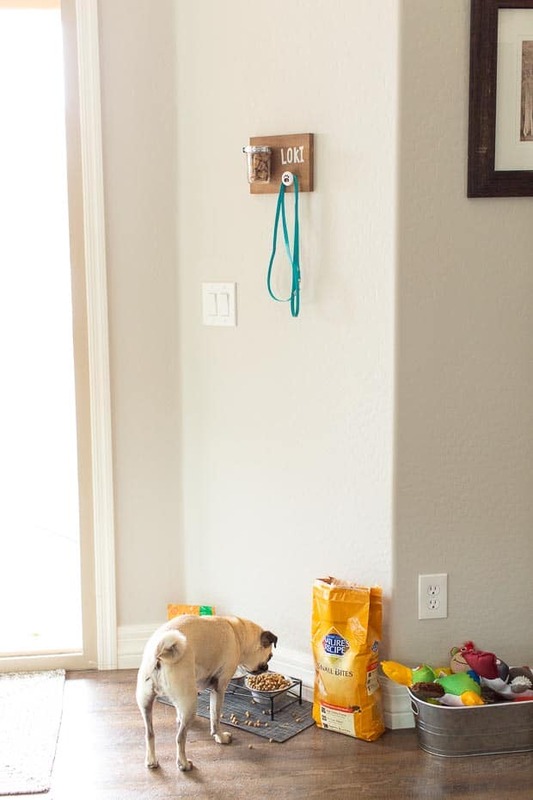 This simple and darling idea holds your favorite dog’s leash and treats in one easy spot! A few years ago, we rescued our little guy, Loki. He was only 8 weeks old when he joined our family. 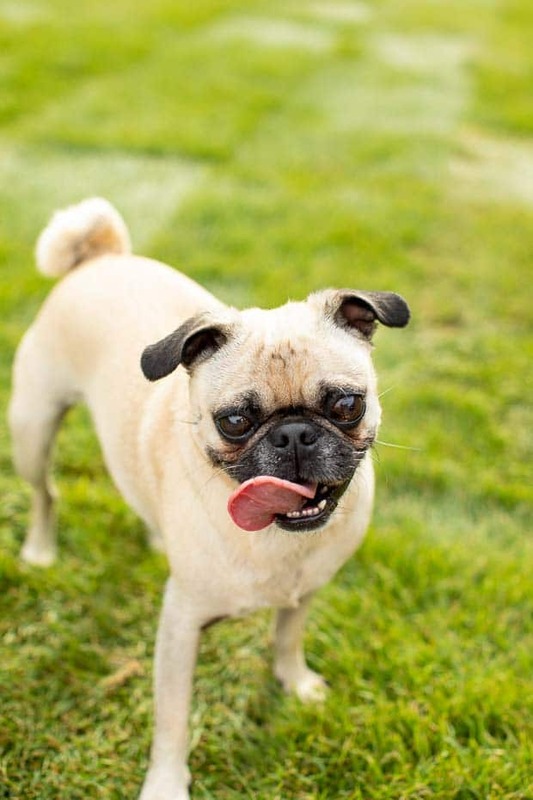 We originally named him Thor which we thought it was an awesome name for a pug. But after he joined our family, it quickly became apparent he was more a Loki – a mischievous little brother. Upon his arrival, he took over our American Bulldog’s toys and bed like they were his own, no questions asked. He’s been a stinker since day one, but I wouldn’t have it any other way. Thankfully, it was an easy transition for our family and Loki has become a wonderful and beloved part of our family. It’s been fun watching Loki grow up alongside our son, Nix. Now that Nix is a little older, he’s in charge of helping with Loki. One of his daily tasks is getting Loki up and out of bed in the morning. He also doles out his morning treat. Needless to say, Loki is pretty fond of Nix. 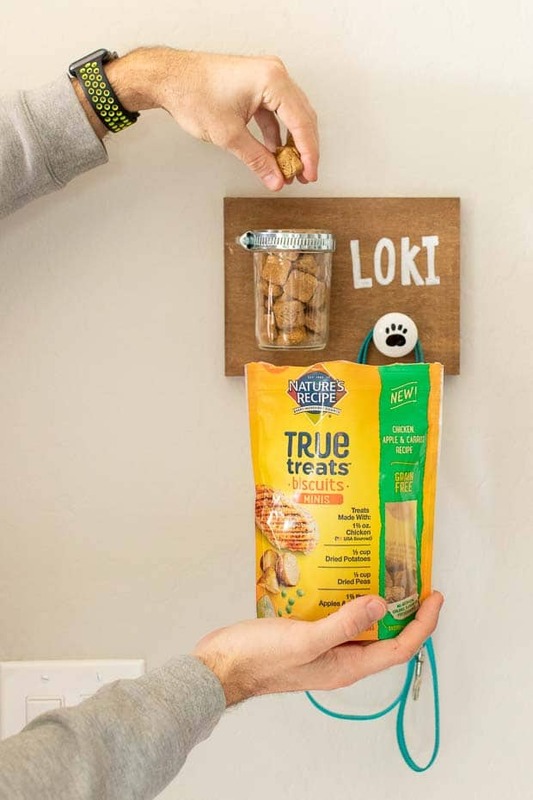 Loki’s favorite treats are new Nature’s Recipe® True Treats™ that are available at Meijer. They’re available in both crunchy biscuits or chewy treats. They help him fuel the tail wag that let us know he’s all kinds of happy. 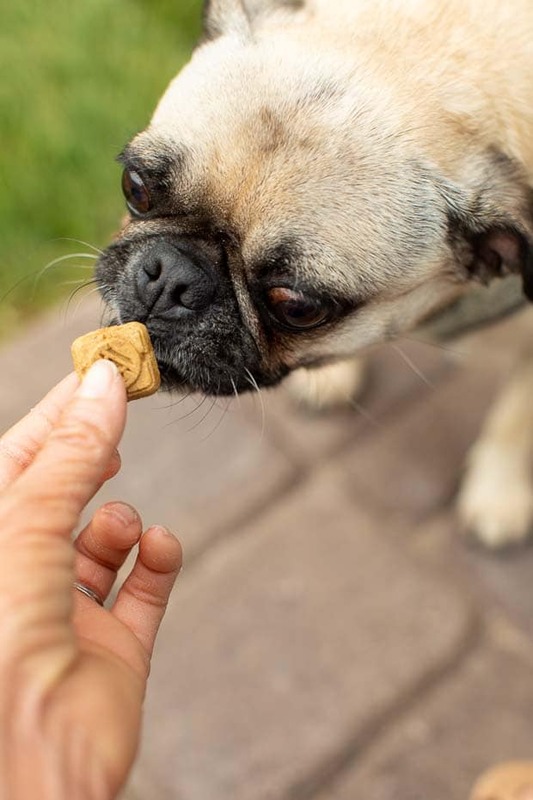 New Nature’s Recipe® True Treats™ dog treats are 100% real and delicious, with ingredients from nature and nothing to hide. There are no shortcuts or fake substitutes in their treats, which makes me feel good about serving them to Loki. 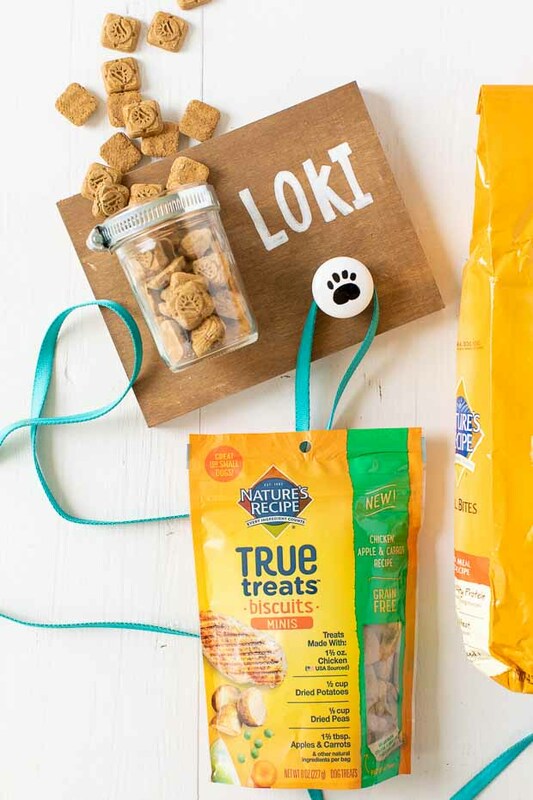 The treats are the perfect complement to Nature’s Recipe® dog food that Loki enjoys on a daily basis. 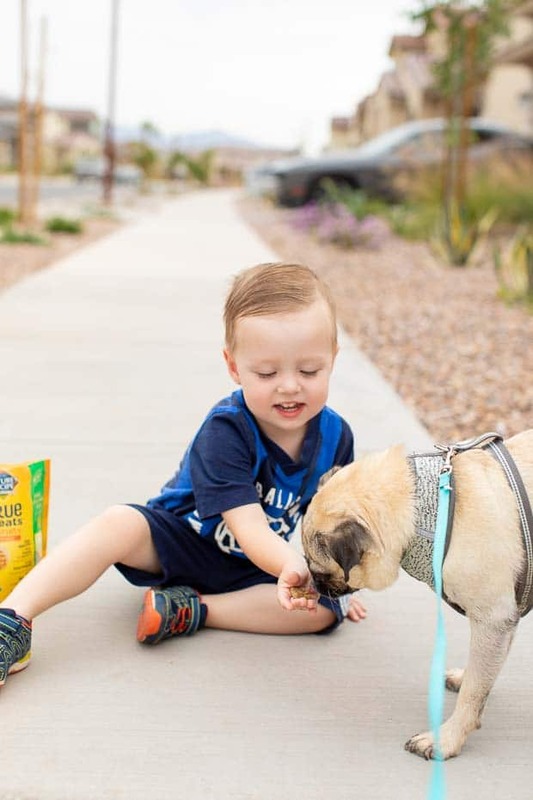 We feed him the Small Bites formula which is made with high-quality protein, no corn or wheat, and it’s perfectly sized kibble for him. Nature’s Recipe® also has a new blend of dog food out now that you can grab right at Meijer – Prime BlendsTM. Prime BlendsTM have real beef or chicken as the #1 ingredient, dual animal protein sources, and are made with wholesome bone broth. I think Loki will need to try that next! 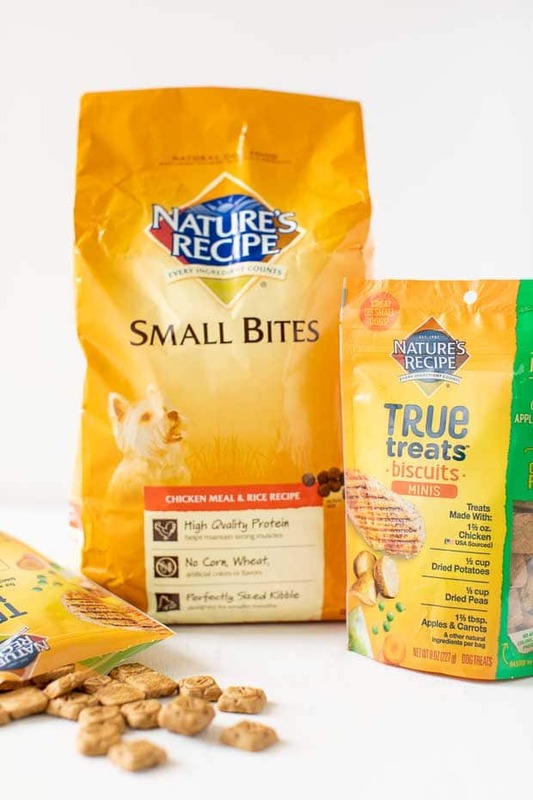 You can pick up both Nature’s Recipe® dog food and their new Nature’s Recipe® True Treats™ at Meijer now and enjoy savings with mPerks Brand Reward. 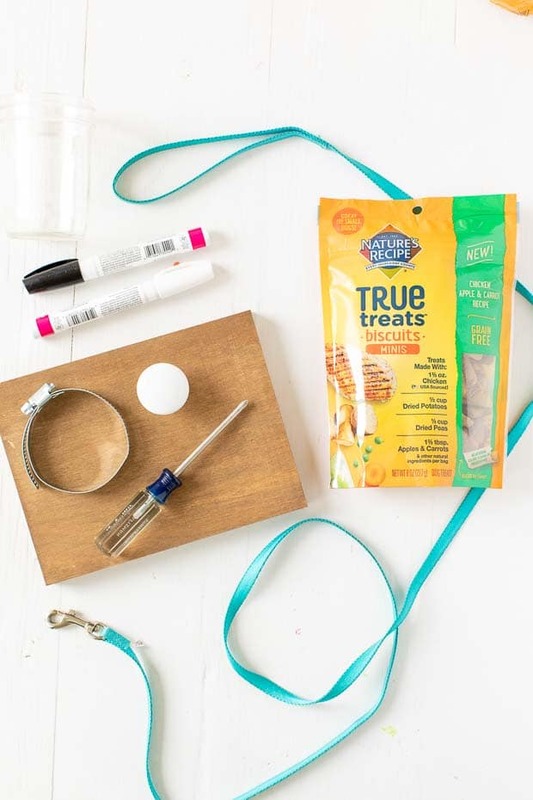 You’ll save $5 off your next Meijer purchase for every $40 you spend on any Nature’s Recipe® dog food or treats from 3/31/19 – 4/27/19. Stock up and then get your DIY supplies out so you can create this darling project. It doubles as a treat holder and leash hanger in one. You can totally customize it, so it’s a great idea to create for your favorite dog. Start by staining or paint your wood. My wood was just a 1x6x piece I had in my scrap pile from a previous project. You can obviously use any size you’d like. If you have more than one dog, you could make this larger to hold more leashes! Lay out your items on the board so you can mark where you’ll need to drill holes. Drill the hose clamp to the board and then use a screwdriver to tighten the clamp around the mason jar. Next, use a paint pen to write your puppy’s name on the board. I also added a paw print on the knob with the paint pin. If you do this, be sure to let it dry before attaching it to the board so you don’t smear the paint! Once everything is dry and attached, you can hang on the wall. Finally, add your dog’s favorite Nature’s Recipe® True Treats™ to the jar so that it’s easy to hand out snacks. I’m really pleased with how this DIY turned out. It’s a great addition to our doggy area. If you have a favorite family puppers, I would suggest grabbing Nature’s Recipe® at Meijer and creating this DIY right away! Get more info on the Nature’s Brand Page now.